We were seriously obsessed with crackers and dip back in the day! We definitely missed them when first starting paleo! So this was one of our very first paleofied recipes! 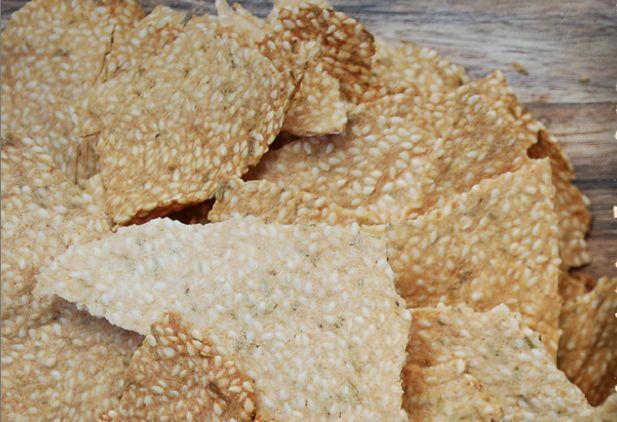 Warning: this paleo savoury cracker recipe is very very very addictive! Enjoy with paleo hummus or beetroot dip! Mix all ingredients together (it should form a sticky dough). Between two sheets of baking paper roll out the dough to 3mm thick (more like thin). Carefully peel off the top sheet of baking paper. Slice the dough into desired cracker size. Place on a baking tray and into the oven for 10 -12 minutes or until golden brown. Let cool and then enjoy with a paleo friendly dip! You can season these crackers with whatever you like! We have tried chilli flakes, cracked pepper, oregano, basil and paprika! YUM!